Where Were You on May 3, 1990? The weeks bookmarking May 3, 1990, were slow ones for news organizations. About the only interesting thing was a lava flow from a Hawai’ian volcano that threatened a few houses. 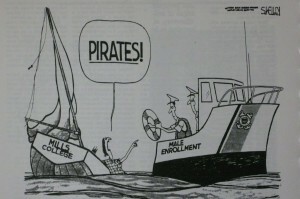 And then Mills, a small women’s-only liberal arts college in northern California, decided to go coed. If you were a regular consumer of news back in the spring of 1990, you probably now remember what you were doing around May 3. When you are the public face of an organization dedicated to women’s rights, how do you avoid getting caught in that feedback loop? Is it possible, in a world where TV talk show hosts dismiss proponents of women’s equality by calling them “femi-Nazis,” to receive fair coverage? Twenty-one years ago, the students of Mills College in Oakland were sitting in doorways, blocking access to campus administration buildings, and behaving like anything but doormats. They were protesting the trustees’ decision to make the all-women’s college coed. I was one of two spokeswomen responsible for explaining to the world’s media (yes, I do mean reporters from all over the world; remember, it was a very slow news week) why they opposed the admission of men. It took only a few hours for students to move into strike mode and effectively shut down the college. 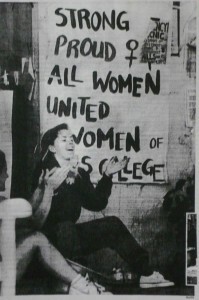 Suddenly, Mills was swept into the world’s headlines, transformed into a symbol for women’ colleges and women’s rights. But, when the students threw off the victim mantle and took a stand on keeping Mills for women only, the headlines, letters to the editor, opinion pieces, and cartoons turned absurd and nasty. Amongst the condescension there was a strong undercurrent of anger. A few even suggested the students should be punished. “When is the administration going to bring in the police to remove students?” we were asked hourly. With the students sitting around studying for finals in doorways, there wasn’t much juicy “Film at 11” footage. The news media was left to rerun the scene of the crying victims. The pre-work we’d done ensured reasoned stories from reporters who’d met students before the decision. They discussed why women’s-only education was important to defend. It was the reporters – and their editorial cartoonists back at the paper – dipping in to the story after the tears who didn’t always offer balanced coverage. 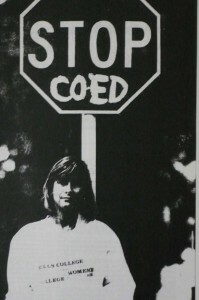 What they accomplished – overturning the coed decision – has never been done before in the history of U.S. education. 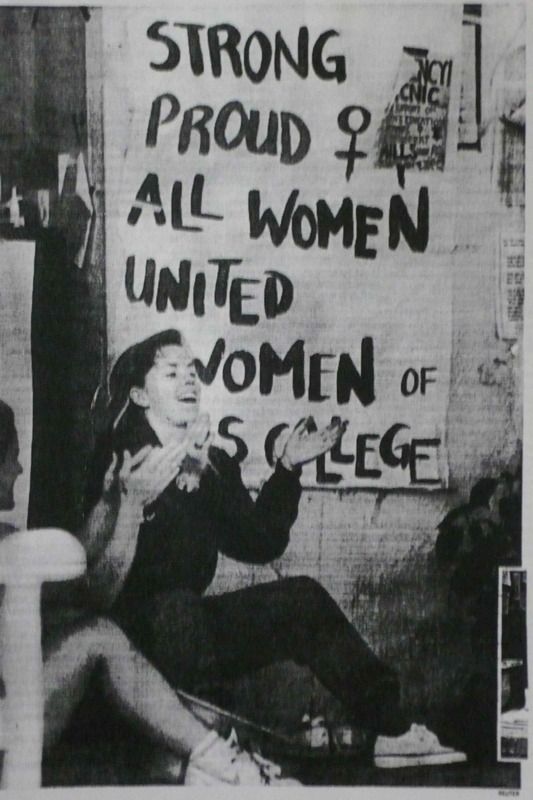 It’s since caused women’s colleges that were thinking about coeducation to re-evaluate, strengthening their resolve to continue to offer a curriculum for women only. After the Mills revolution, other stories, such as the Clarence Thomas confirmation hearings, received wall-to-wall coverage. Since that time, I’ve noticed more women giving testimony in the news media about the empowerment they’ve received because of the fight for women’s equality. In fact, if you’re a woman, and you’ve ever told someone you feel empowered, you probably have Mills women to thank for that particular vocabulary choice. This is not to say that 777 Mills students are entirely responsible for the resurgence of feminism and the support of true equality, but there’s no denying they were out there at the forefront, pushing women’s issues back into the public arena at a time when most politicians, reporters and even feminists were trying to sweep them under the doormat. This entry was posted in Uncategorized and tagged Mills College, PR by Vickie Bates. Bookmark the permalink.